PJ Johnnie, Aurea Tomeski, Brent Shultz, and Amy Fulgham in Lamia. Photo by Jaqueline Janis. 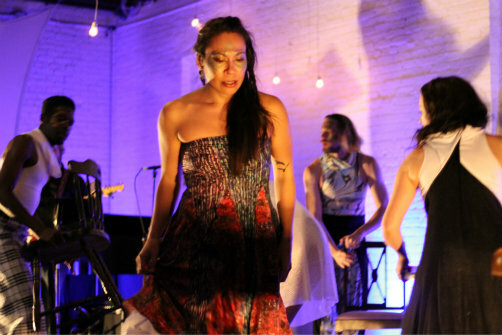 BOTTOM LINE: A visceral experience of love through word, music, and dance. Lamia begins with sound and movement. An electric acoustic band (John Barber, Janna Pelle, Alex Major, Natalie Lowe and Dan Keller) plays against a brick wall as the ensemble, starkly lit, begins a dance combined with spoken word describing the existence of humans and creatures. When the dance ends, a new story begins—a young bride (Janice Gerlach), unable to sleep, wants to hear a story to ease her mind about her upcoming marriage. She is then told a miraculous story by a narrator (Amy Fulgham) about a snake (Aurea Tomeski) who longs to be a human and find the meaning of love. The snake gets her wish granted by a seemingly devious woman (Kelsey Foltz), and begins a journey through human life and relationships always knowing that regardless of her appearance, there will always be a snake inside of her. The story is told both verbally, through Fulgham’s narration, and physically, through the movement of the remaining ensemble members. The movement, grounded in contemporary and modern dance, combines fluidity with bursts of energy to allow the performers to explore love in both their words and bodies. And the ensemble members use their costumes excellently, allowing them to physicalize the transformation between human and snake, and turn movers into shapeless creatures, almost inhuman. As the story unfolds Gerlach, as the bride, does a remarkable job of sitting, transfixed watching the Snake’s relationship with her lover (Brent Shultz) unfold—their joy, their sexual awakening, and their conflicts. The bride then, through movement, compares this with her own relationship, always anxiously happy yet weary of the conflict that may come. Music serves as another medium to explore this love, with the onstage musicians breaking the dance pieces and formal storyline by adding their own commentary through indie rock love songs. These songs pull at the heartstrings, and give audience members a chance to step out of the action and recall their own loves. Indeed, Lamia continually breaks the fourth wall, allowing the audience into the fantasy world. Tomeski pleads with the audience about concealing her snake-like nature; she is alone with her thoughts and yet physically and emotionally open enough to let viewers in. Similarly, Foltz’s heartbreakingly human justification of her choices and explanation of her background seem a direct appeal to the audience, making fantasy suddenly relatable. Though at times unclear, and extremely untraditional, Lamia is more than a show—it creates a full theatrical experience that engages the audience in thought and action, calling into question the faith we all place on love. Lamia is written by Molly Haas-Hooven with music by John Barber and Janna Pelle. Directed by Suzanne Karpinski. Choreography by Shannon Stowe. Lighting Design by Alejandra Fajardo. Costume Design by Jessica Lapidos. Sound/Light by Jason Smith. The cast is Kelsey Foltz, Amy Fulgahm, Janice Gerlach, PJ Johnnie, Brent Shultz, and Aurea Tomeski. The band is John Barber, Dan Keller, Natalie Lowe, Alex Major, and Janna Pelle.